April 2-8, 2017 has been selected as National Crime Victims’ Rights Week (NCVRW). During this week, organizations throughout the country host events to stand with crime victims and to remember the suffering endured by so many at the hands of criminals within our communities. These organizations also recommit themselves to seeking justice for crime victims and ensure crime victims’ rights are upheld. On April 4, 2017 the Kings County District Attorney’s Victim Witness Assistance Program held their annual quilt unveiling ceremony to honor crime victims of Kings County. During this event, Kings County District Attorney Keith Fagundes recognized several individuals for their dedication to supporting crime victims. 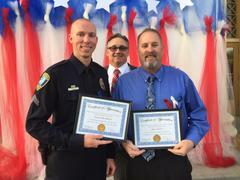 Of those recognized were Sergeant John Harris and Corporal Daniel Mcalister of the Corcoran Police Department. Fagundes thanked them for their hard work, dedication and compassion shown toward crime victims in their efforts to seek justice. Sgt. Harris and Cpl. Mcalister exemplify the dedication of the Corcoran Police Department to working with crime victims and obtaining justice for them. NCVRW is a good reminder of the Corcoran Police Department’s pledge to valiantly seek justice for all of those harmed by criminals within our community and we ask that everyone stand with us to support crime victims.